Deep learning has recently been applied to various research areas of design optimization. This study presents the need and effectiveness of adopting deep learning for generative design (or design exploration) research area. This work proposes an artificial intelligent (AI)-based design automation framework that is capable of generating numerous design options which are not only aesthetic but also optimized for engineering performance. The proposed framework integrates topology optimization and deep generative models (e.g., generative adversarial networks (GANs)) in an iterative manner to explore new design options, thus generating a large number of designs starting from limited previous design data. In addition, anomaly detection can evaluate the novelty of generated designs, thus helping designers choose among design options. 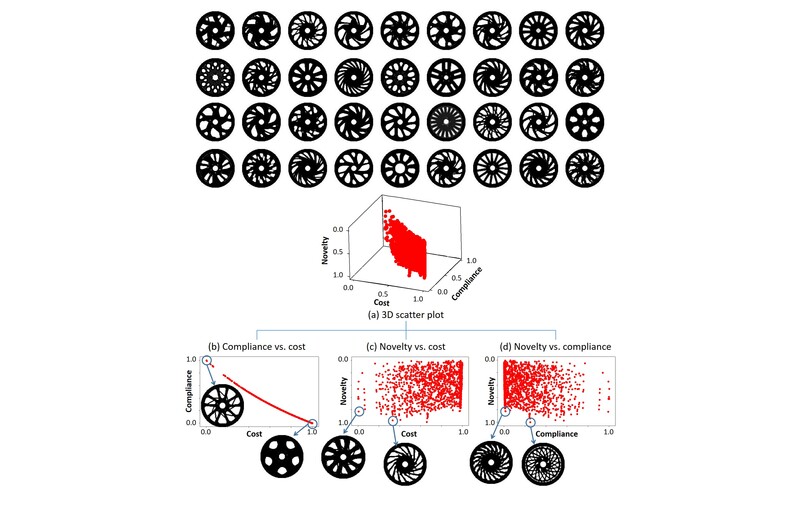 The 2D wheel design problem is applied as a case study for validation of the proposed framework. The framework manifests better aesthetics, diversity, and robustness of generated designs than previous generative design methods.